This past weekend was the 51st Annual Das Awkscht Fescht, Macungie's largest vintage and antique car show. For those that aren't aware (and why would you be), Macungie is located about 54 miles north of Philadelphia, in the south-west outskirts of the Allentown area. This is typically a great show, and this year didn't disappoint. I attended Saturday, checking out the nearly 1,200 cars in attendance. There is a wide variety of vehicles on display, ranging from the early 1900's to the late 1980's, and everything in between. All time periods are very well represented. Oakland was founded in 1907, and was later bought by General Motors in 1909. Oakland was defunct by 1931, a casualty of the General Motors Companion Make Program. The first thing you may notice about this particular Oakland is its overall condition. Everything on this Oakland is original. 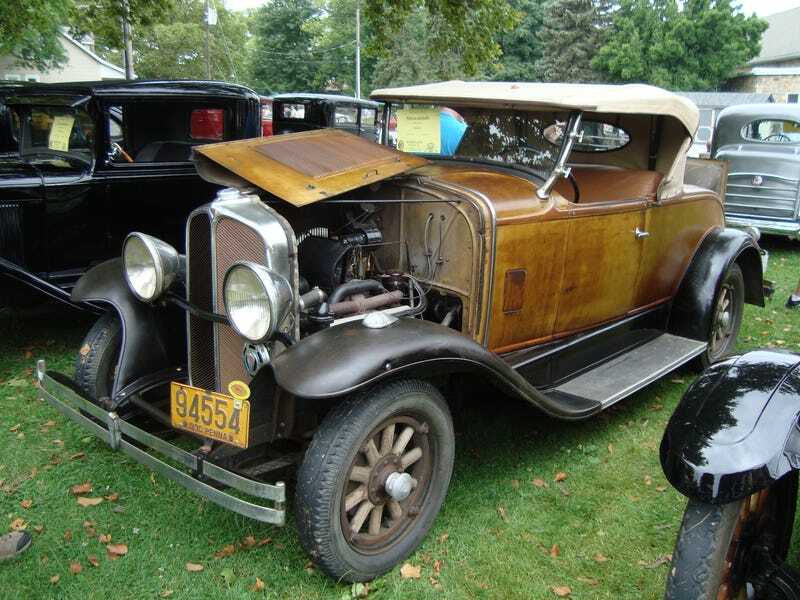 The paint, the upholstery, the suspension, the wooden wheels and hubcaps, and even the grille are all original. Speaking of that grille, it was painted the same color as the body when it was new. Now it has matching patina. The 251 cu. in. V-8, while having been rebuilt, is original as well. Also present: a rumble seat, and locking spare tire holder. This 1930 Oakland Roadster was captivating. It's status of being built in the second to last year of Oakland's existance, coupled with its originality, made it a standout of the show.